Brenda Cheer believes early support is key. Children with continence problems are often stigmatised because health professionals, schools and parents fail to address bladder and bowel problems, according to Brenda Cheer, the first specialist nurse appointed by the national children’s continence charity ERIC. ERIC – or Education and Resources for Improving Childhood Continence – says the need is huge. Using a three-year Department of Health grant, the ERIC nurse project wants to change attitudes through a pilot project in the Bristol and South Gloucestershire area. It uses targeted information leaflets to raise awareness of healthy bladders and bowels, helping professionals to spot early continence problems and refer families for support. Nearly one million children and young people in the UK live with a continence problem. One in 12 UK children has a bladder or bowel problem. Between 1% and 2% of UK teenagers wet the bed. There are 14,500 UK hospital admissions each year for constipation and urinary tract infections in children. An estimated 80% of admissions could be prevented with better primary care. While one in 12 children are affected, only 11% access treatment. Yet treatment has changed enormously in the past five years, says Ms Cheer, who works as an ERIC nurse three days a week while continuing two days a week in the paediatric specialist continence nurse post she has held at University Hospital Wales since 2003. Ms Cheer follows three 2010 National Institute for Health and Care Excellence guidelines covering idiopathic constipation, night-time wetting and commissioning paediatric continence services, which recognise that the issues are linked and recommend treating them as medical not psychological problems. 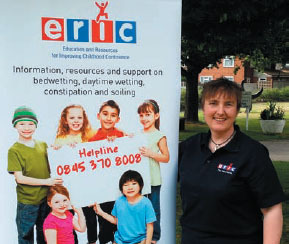 ERIC now provides leaflets for parents and early years staff that address many of the points Ms Cheer covers in her training programme for health professionals, including how to recognise healthy stools and that runny stools may also signal constipation. In addition they cover making sure children have fluids in quantities appropriate for their age. Parents and carers are also reminded to avoid giving children drinks containing caffeine, which is a diuretic. Waterproof covers in beds are key, Ms Cheer says, so accidents don’t matter, the stress is taken away and it stops the issue becoming a psychological problem. She is currently revising the Bristol children’s continence care pathway to help health professionals know where to refer patients. The charity is also using Children in Need funding to develop a children’s panel, so children and young people can directly influence its work. Ms Cheer’s role is to champion best practice among commissioners and healthcare professionals so children with continence issues get support early. Her next step is to demonstrate the effectiveness of the pilot project so it can be rolled out across the country.